This map is a vulnerability picture of the Arctic. Areas in deeper burgundy are considered more environmentally vulnerable during summer due to the walruses, seals, and the large number of whales feeding in the area. 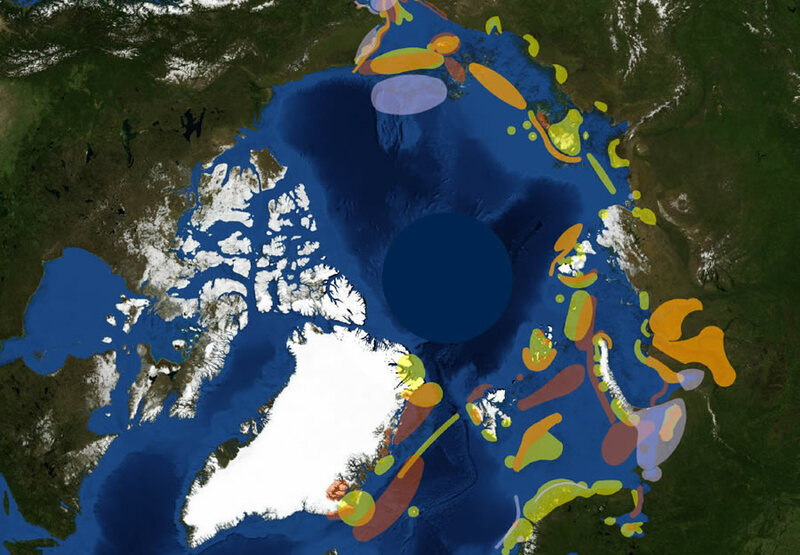 DNV GL, based in Norway, launched The Arctic Risk Map, an online app that contains a wealth of information about oil and gas activities, shipping routes, ice conditions, and wildlife in the world’s northern polar region. 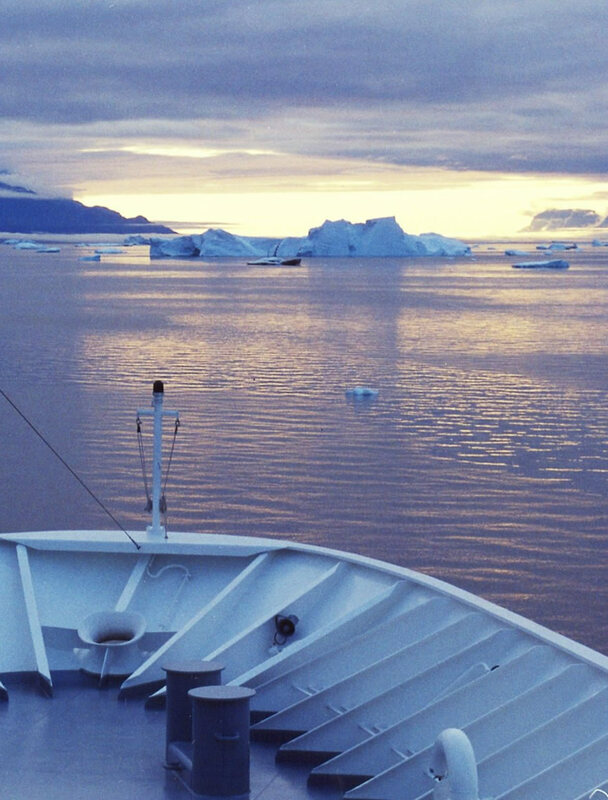 With melting ice in the Arctic opening up navigable waters for longer periods each year, the region offers increasing opportunities for business ventures in the energy and shipping industries. The Arctic has substantial hydrocarbon reserves, and ships traversing its waters could take routes that are shorter than usual. However, the Arctic remains subject to harsh and unpredictable weather and has a unique ecosystem. Any plans for development there must be analyzed for risks and vulnerabilities and should include steps for safeguarding life, property, and the environment. Anyone can access The Arctic Risk Map, though it will be mainly of interest to energy and shipping companies, conservation groups, and other organizations interested in the Arctic region and its environment. “We wanted [the online map app] to be open so anyone could go in there and try to answer the questions they have themselves,” said Aarnes. The app presents an array of complex pieces of information in an accessible format, including the seasonal distribution of ice, meteorological and oceanographic conditions, sea ice concentrations, biological and wildlife data, shipping traffic, and oil and gas resources. Users can select the entire Arctic to explore or a particular area such as Kara Sea, Laptev Sea, and Barents Sea. The app also includes a 12-month time slider to show what changes occur from January to December. This map displays the locations of environmentally vulnerable marine mammals combined with Arctic shipping routes, visible as red lines. Ships hauling heavy fuel oil travel along these routes. Users can also combine the app’s data layers with their organization’s own data to make even more precise decisions about risk. This allows petroleum companies to minimize the impacts of their activities in the Arctic and helps conservation organizations evaluate ecologically sensitive areas. The scientific data in the map app comes from numerous predictive climate and oceanographic models provided by organizations such as the National Oceanic and Atmospheric Administration (NOAA), the European Union’s COPERNICUS program, and the Computational and Information Systems Laboratory (CISL) of the National Center for Atmospheric Research (NCAR). 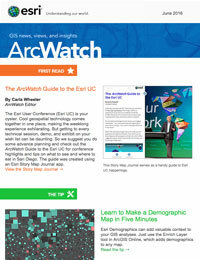 DNV GL hosts the data in ArcGIS for Server as map layers and services. 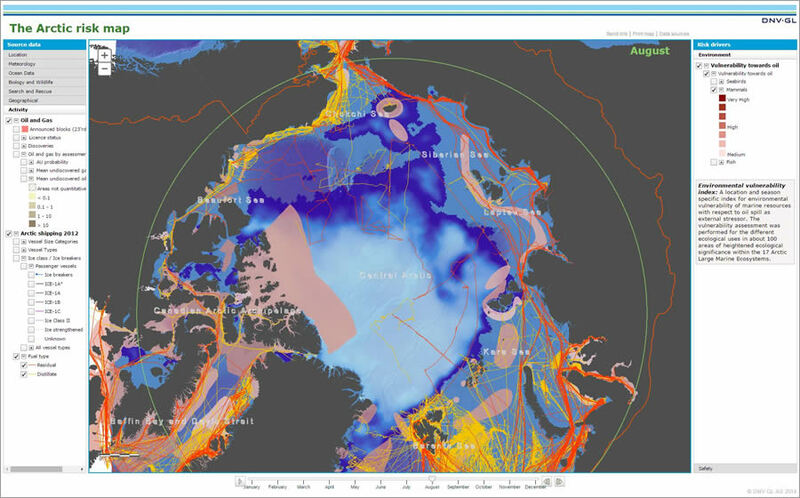 By integrating this data with GIS technology, The Arctic Risk Map identifies the drivers of risk: low temperatures, storms, snow, ice, darkness, ocean depth, the presence of wildlife, and the lack of search-and-rescue facilities. The map app also makes it easy to visualize how these risks vary from place to place and season to season. Sea ice covers large parts of the Arctic Ocean during wintertime and retreats to the center of the Arctic during summertime, unveiling channels and coastlines to open water. The Arctic Risk Map can be used to easily see seasonal and spatial variations of ice throughout the year and assess safety and operability in the region. This information helps energy companies schedule exploration and production by providing a basis for deciding when and where it is feasible to work in the Arctic. The map app also features data on extreme temperatures, which is especially important to engineers as they design oil rigs and other structural assets to withstand the Arctic’s harsh climate. Vessels laden with heavy fuel oil operate close to the edge of the ice and near vulnerable fish and sea mammals. The Arctic Risk Map also shows areas of the Arctic that should be avoided to lower the risk of oil spills. It also helps shipping companies analyze traffic separation schemes, plan traffic lanes, and set up separation zones. This reduces the likelihood of shipping collisions in areas where the repercussions would be considerable. As less and less ice clogs shorelines and channels, Arctic animals become more vulnerable to various ventures that encroach on their territories. Walrus, polar bears, seals, beluga whales, and narwhals are all Arctic dwellers, living alongside many other species that are currently or on the verge of becoming threatened because of changes to their environment. The Arctic Risk Map includes data on where fish, mammals, and seabirds breed, feed, live, and migrate. The map is divided into 17 Large Marine Ecosystems (LMEs), a decades-old concept that the Arctic Counciladopted to encourage an ecosystem-based approach to management in the region. The Arctic Risk Map‘s environmental vulnerability index combines wildlife data with a map of the LMEs to let users see how external factors such as oil spills would affect Arctic species and their habitats. It also shows where shipping lanes and wildlife habitats increasingly overlap. Locating and mapping these sensitive areas provide a geospatial guideline for planning hydrocarbon development and routing ships. But, as Aarnes pointed out, the data on marine species—especially the mammals and birds—needs to get more specific. “The Large Marine Ecosystems are kind of [a] recognized and acknowledged way of separating regions in the Arctic,” Aarnes said. But he feels that dividing the Arctic into subsections would yield greater detail. With more comprehensive information about species’ migration patterns, food preferences, and habitat changes due to shrinking ice levels, businesses such as tourism, fisheries, hydrocarbon development, and shipping will be less likely to come into conflict with the Arctic’s ecosystems. “We wanted to also stimulate a discussion on how we can better manage the Arctic,” said Aarnes. And that appears to be happening. Working groups such as the Conservation of Arctic Flora and Fauna are interested in getting more environmental data into the Arctic Risk Map. The Arctic is not a uniform environment. Environmental risk varies from place to place and changes from season to season based on weather and climatic conditions, shifting wildlife habitats, and human activity. With its aggregated spatial and seasonal indexes, The Arctic Risk Map helps organizations operating in the Arctic plan activities, schedule events, and engineer structures in ways that improve safety and reduce environmental risk in this unique ecosystem. “We wanted to raise some awareness with this map,” Aarnes said.